Disclaimer: This website is not affiliated with, licensed, or endorsed by NBCOT®. This site is published by an independent group of occupational therapy professionals supporting our community. Then you are probably searching questions about the exam, tips for how to prepare, and most importantly – for the best OT/OTA practice exams and questions to study. Well, this guide will help you prep for the NBCOT exam. A team of Occupational Therapy professionals got together with professors and students to create this article and downloadable study guide to help you ace the NBCOT exam on your first attempt. 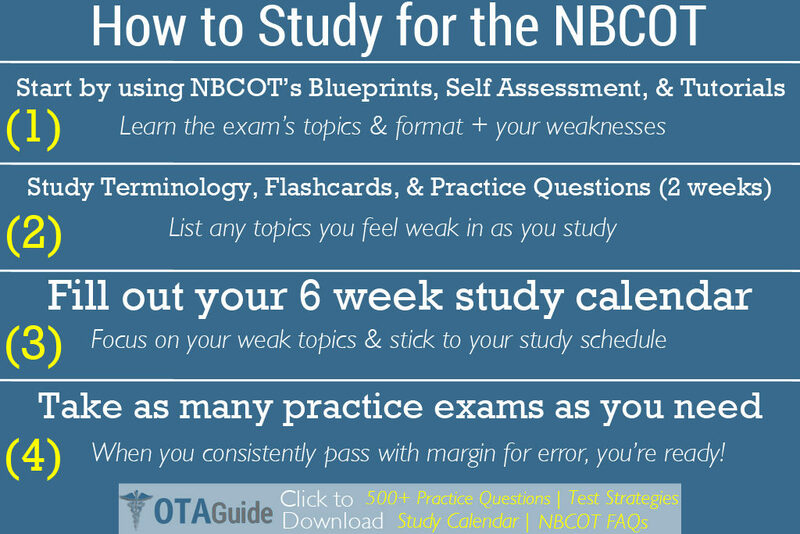 We spent a lot of time putting everything you will need to prepare for the NBCOT exam, in one place. This should save you a ton of time researching questions, looking for study material, and wondering whether you are studying the right material. With our guide the only thing that you’ll need to do, is study, until you are consistently passing the practice tests with some room for error. So just stick to the study calendar we provide and remember that passing this exam is what will make the 5 figure investment in your education worthwhile. By the time you’re done reading this article and downloading our complete study guide you will be equipped with everything you need for your OT exam preparation plan. You will be able to fill in your study schedule and start on the practice questions right away. But really quick, please help us continue creating awesome free resources for the OT community by giving us a “tweet”, “like”, or a “+1” and then you can instantly access your free & complete Occupational Therapy exam prep guide prepared by Occupational Therapy Professionals, Professors, and Students! For those aspiring to become a COTA or an OTR, even if you study online, the NBCOT exam is your final test before you can go out and pursue your career. We recommend applying for the NBCOT exam and scheduling it ASAP after graduation so that everything you’ve learned is fresh and you have good momentum going into the exam. With so much hinging on one exam, preparing can be an extremely stressful experience. We get it. And we are here to help ease the stress by providing a step by step guide to passing the NBCOT exam. Then you go ace the NBCOT Exam! See, you can stop stressing, you got this. Now let’s get started with the NBCOT exam blueprints. Before you dive right into studying for the NBCOT exam, it is good to learn the structure and format of the exam. The NBCOT provides an exam blueprint for the OTR and COTA exam. The blueprints provide the percentages of the exam that will be dedicated to each occupational therapy domain. This can be used as an outline for your study efforts. These blueprints will help guide your study efforts by showing you how much of your time to focus on different subject areas. For example, 8% of the COTA Exam is dedicated to upholding professional standards – this means that about 8% of your study time should be spent studying OT ethics and professional standards. If you download our free exam prep package then these blueprints will help you fill in your 6 week study schedule timetable. Learn more about the NBCOT Exam blueprints here. The best starting point when studying for the NBCOT exam is the NBCOT self-assessment tool. There are both COTA and OTR tools. The purpose of the tool is to assess the user’s knowledge, experience, and skills across each of the domains or practice areas of occupational therapy that makeup the exam (from the blueprints above). You can save a PDF report of your assessment, which will provide a summary of your strengths and weaknesses to help you tailor your study efforts. Once you’re equipped with your exam blueprint and your self assessment you can not only see how much of the test is created for each OT domain, but also how strong/weak you are in each domain. This information is essential so that you know which material you already understand and which material you need to study the most. When you are ready to start preparing for the NBCOT exam, the NBCOT Exam self assessment tool should be your starting point. Now that you know your strengths and weaknesses, it is time to get familiar with the NBCOT Exam’s format and style of questions. The NBCOT provides free OTR and COTA exam tutorials to introduce the exam’s format and style of questions. When you access the tutorial, you will get experience with sample multiple choice questions like you’ll see on the real exam. And for OTRs specifically, the tutorial will include some clinical simulation problem examples. Go ahead and complete the tutorial, it won’t take long and it will be the best introduction to real NBCOT exam questions. After you see and make an attempt at the practice questions in the tutorial, you will have great insight into how you should study. There are a lot of practice exams and questions out there, both free and paid, making it easy to get lost when studying. In this section we want to help you avoid getting lost and tell you exactly how to and how long to study for the NBCOT exam. We wouldn’t recommend spending most of your time on the free exam prep resources. That said, they do offer value and can be used as a starting point of study material for the NBCOT. As a general recommendation, keep in mind everyone is different, we would suggest spending 2 weeks studying these free resources and our study guide. Then spend 6 weeks studying one of the 3 exam prep courses for purchase below focusing mostly on your weak areas. Download our free OT/OTA exam prep package now. This package includes a study schedule and package of NBCOT practice exam questions. As you practice the questions and learn your weaknesses you can fill out your study schedule with the most important topics and weak areas to focus on. Studying the free material will give you some idea of the exam format and your strong/weak areas. Knowing this will help you plan your study schedule efficiently and choose the best NBCOT practice exam or study guide that costs money. Then the purchased guide will provide even more detailed scores and feedback on your practice tests helping you improve your weaknesses. Ever heard of StudyStack? It is an awesome free study resource for students to share their study guides, flash cards, practice exams etc.. It has a strong community of occupational therapist and occupational therapy assistant students who are studying for the NBCOT exam and sharing their practice tests, questions, and flashcards. Check it out. The Occupational Therapy page at StudyStack is updated frequently by students who upload their flash cards they make studying for the OT/OTA exams. You can click through the flash cards to study any OT topic. It is a really great tool that even works on your phone, you can flip through stacks of flashcards on various occupational therapy topics whenever it is convenient for you. And there are literally hundreds if not thousands more flashcards over at the StudyStack. Ever heard of Quizlet? It is an online quiz platform where teachers and students can instantly create and share quizzes by uploading questions and study material to the website. You can create groups and you and your peers can upload material for a test and study together, all your study scores from quizzes and tests will be tracked. There are hundreds of OT programs, students, and teachers using Quizlet to study for the NBCOT exam every year. You can search by college name, exam name, and more. The content is different than what you will find on StudyStack, users can upload images and more and Quizlet will format the uploads into different types of learning modules such as flash cards or quizzes. Users can then consume the content in the form of their choice, they can simply view the content, view it as flash cards, view it in a multiple choice test form, etc. So in addition to flashcards, you can find practice exams and sheets of OT terminology. One nice feature of Quizlet is that you can play audio of the material if you want to listen in the car or while you do something else. One tip on Quizlet is to look for users marked as “Teachers” as they typically share the best NBCOT study material. Here is one of my favorite OT professors on Quizlet who shares great study material for the NBCOT exam. Social media is a great place to connect with other students and teachers to share and discuss NBCOT practice questions and study material. If you don’t have a group of peers to collaborate with on social media then you should consider following these social pages for great NBCOT study resources and student/teacher discussions. Checkout our Pinterest Board for the best pins to help you prepare for the NBCOT exam. Nearly every day we are finding new pins that are great for COTA and OTR exams. We pin everything from NBCOT practice tests, flashcards, and exam FAQs to tips from licensed occupational therapy professionals on how to pass the NBCOT exam. Whether you are taking the OTR exam or the COTA exam, if you have some budget then you can afford to purchase an exam prep course. Considering what you have already spent on your degree you will probably feel that purchasing an exam prep package is worth the $85 – $140 cost. First use our free exam prep package and the free resources in this article to study, we generally recommend doing this for about 2 weeks to learn your weak areas. Then we recommend spending 6 weeks using one of the study course options below where you can create your own practice exams focusing on your weakest topics. This is the most efficient and effective way to improve on your weakest subjects. The reason we recommend purchasing a course, is to test your knowledge in real exam format and receive more in-depth score and feedback reports. 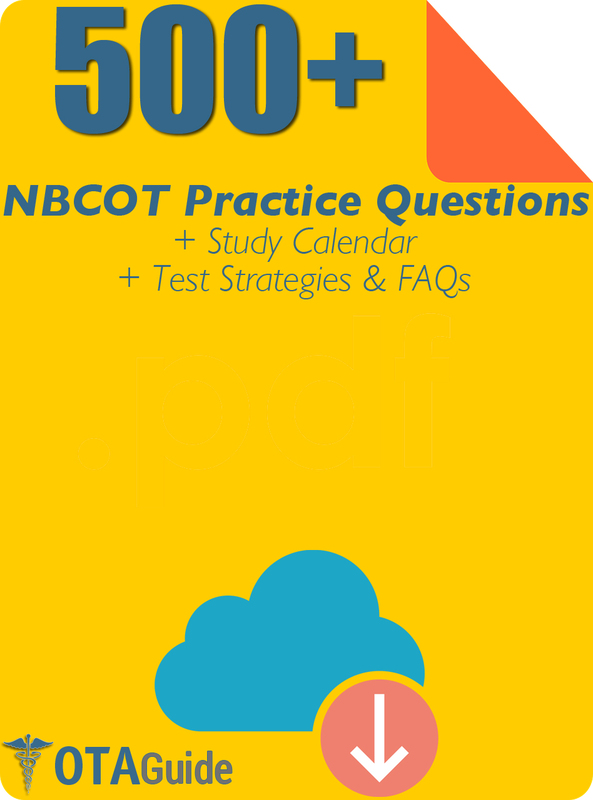 This will give you exposure to NBCOT practice tests full of sample multiple choice and clinical simulation NBCOT practice exam questions with detailed feedback on each question that you miss. We selected these options based on user feedback from students who used these study guides and passed the exam. We think all of these options are great and hope this info helps you choose the best study material for your needs. Below is more information with links to learn more about each program on the best exam prep courses full of practice exams and questions. This prep product for the NBCOT exam is a popular option provided from a credible organization, the American Occupational Therapy Association (AOTA). There is a version for both OTR and COAT exams both of which are offered completely online. These NBCOT exam study guides by the AOTA are a bit pricier than some of the other options but they are unique in providing item level feedback. You can also create your own exams from 1,000+ questions which is a very valuable feature because you need to take many practice tests to prepare for the NBCOT. Below are the highlights of this program. NBCOT sells online COTA & OTR practice exams that reflect the structure and format of the timed exam. These practice tests consist of 100 current items that are consistent with the actual certification exam. The exams are for purchase online and can be accessed online 24 hours per day. The exams can be taken with a 2 hour (real simulation) or 4 hour time limit (practice simulation). Upon completing an exam the student will receive a report showing their overall results as well as domain level results. However, unlike the AOTA’s practice exams, item level feedback is not provided for each question. A lot of students choose TherapyEd exam prep materials. They are quite a bit cheaper than the AOTA options while still providing a lot of valuable study material. Plus some schools will chip in and pay for part of the study package (check with your professor). Users can select between participating in a study course or purchasing the study material or they can do both at a discount. The current editions for OTR and COTA exams come in full color with 3 practice exams and the ability to create your own exam using software. Users will also receive feedback on their practice tests to help them with their strengths and weaknesses. The program also provides guidance on the exam as well as test taking strategies and tips. Based on feedback from test takers, this is a helpful all in one exam prep package that will prepare you for the exam as long as you diligently study the material. We compiled the best tips we’ve heard from occupational therapy professionals in regards to preparing for, studying for, and passing the NBCOT exam. Everything from study tips to dressing comfortable for the exam will be covered here. As soon as possible you want to start gathering your study resources for the NBCOT exam. There are tons of paid and free options for study materials and you don’t want to get bogged down with trying to study too many. Start with our free OT exam prep package to get a feel for the study material and to learn specifically which weak areas you need to focus on so you can schedule the right amount of study time for each of these topics and purchase the right prep course for your needs. Scheduling your exam is really important. It creates a deadline which will help you to buckle down on your study schedule and get prepared. Also, the sooner you schedule it after graduation the more momentum you will have going in. The material you’ve learned will be fresh and you won’t build up anxiety by waiting for a long period of time after graduation to sit for the exam. Schedule your exam here. Included in our download of practice questions is a study calendar for you to take note of your weak areas and to schedule ample time for studying those topics. Everyone is different but we surveyed some occupational therapy professionals to see what they recommended for studying and everyone said at least 6-8 weeks of studying was necessary with at least 2 – 4 hours of studying per day. Of course these metrics will vary, but this should provide a good starting point. We recommend studying our free NBCOT questions for about 2 weeks to get a feel for the content and to learn your weaknesses. Make notes along the way of your weak areas and use our free study calendar to schedule ample study time for each topic. Download our practice questions and free study calendar here. Practice tests are an essential part of OT exam prep as they provide insight into the test format, types of multiple choice questions, and example clinical simulation questions. After taking a few practice tests you will have developed a good pace for getting through the exam and you will have a good feel for the questioning which will increase your confidence. Keep taking practice exams until you consistently pass them, with a margin for error, within the allotted time frame. At this point you should be ready to go pass the real NBCOT exam! Although some review the night before can be helpful, don’t study too hard. At this point you really do know most of the information that you will be able to know before the exam. It is wise to spend some time reviewing what you know but studying new material or material you don’t know this late will not help you. You’re time will be better spent doing something relaxing to rest your mind and relieve some stress so that you sleep well (try to get 8hrs) and go into the exam fresh. Take a walk, run a bubble bath, watch re-runs of your favorite funny show, call your sibling… whatever your cup of tea is, make a cup. The best advice for exam day is pretty simple. Keep in mind that the clinical simulation questions will come first and then you will take the multiple choice section. Here are some helpful tips for exam day. 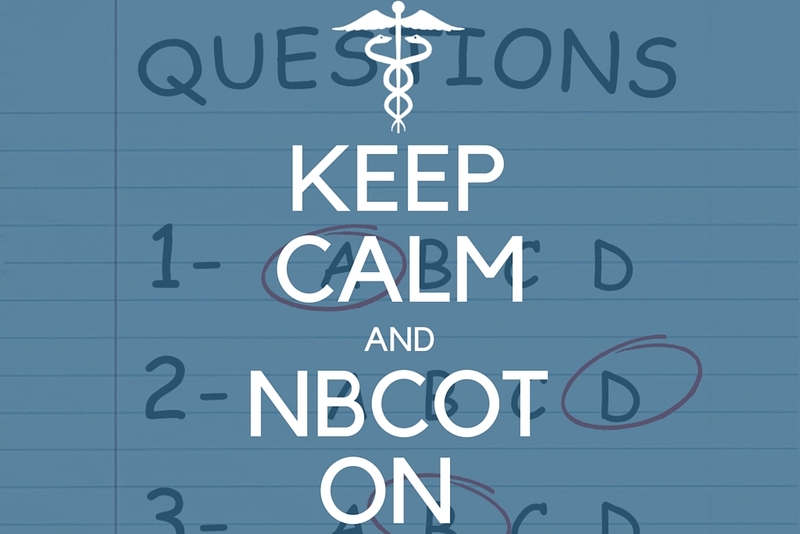 We’ve compiled the most frequently asked questions regarding the NBCOT Exam. We answered the administrative questions and we then surveyed a sample of COTA and OTR to get answers from a group of students who passed the exam about the exam prep questions. Hopefully we’ve got your question covered here, but feel free to drop a comment if you have additional questions. The application fee is $515 online or $555 mailed in. There is also a $40 fee for score transfers plus a $40 confirmation fee. What can/can’t I bring into the testing room? Where do I apply for the exam? Here is the NBCOT exam application, and you can learn more about the application process here. Where do I schedule my exam? Submit an online application at nbcot.org or mail one in. Then send in your college transcript and fieldwork verification to the NBCOT. You will then be issued an Authorization to Test (ATT) letter. At this point you may schedule your exam through Prometric at www.prometric.com choosing the closest testing center to your location. Learn more about scheduling your exam here. Test takers may reapply immediately after taking the exam but must wait 30 days from the failed exam date before they may test again. You restart the process of paying the fee and being issued an ATT letter. You may retake the test as many times as needed to pass in some states but some states impose a limit on the # of attempts allowed to pass in order to obtain a state license. What are the pass rates for the NBCOT exam? See Official NBCOT Exam Performance Data here. Will questions be asked one at a time? Are you able to mark questions and go back to them? Yes, you can revisit questions and change your answers. After you answer a question, making your selection, are you able to go back and change your answer selection? Yes, for the multiple choice questions you can change your answers. For clinical simulation questions once you mark your answer and move onto the next you cannot go back and change your answer. If you could give one piece of advice to a student preparing for the NBCOT exam, what would it be? Read the question and all of the answer choices. You should usually be able to eliminate 2 of the 4 answers. Then reread the question and select from the remaining two answers. Describe your testing environment in detail. Typical exam room with rows of computers set up in cubicles dividing them. You’re able to wear headphones to cancel outside noise. You’ll be in a room with folks taking a variety of exams such as the SAT and ACT. There are about 30 people in a test room. What items are students allowed to bring into the exam room? Exam takers will be given a wet marker & board and this is all test takers may take into the exam room. You’re not allowed to bring water but you are allowed to take bathroom breaks (although they use up your test time). You will be given access to a locker for bags, purses, sweatshirts etc., it will be right outside the exam room. If you are found accessing a cell phone, any electronic device, or referring to exam related material during the testing process you will be required to step out of the test administration area. Your exam will be terminated and your future exam status will be determined by the NBCOT. The OTR exam has 170 Multiple Choice questions and 3 clinical simulation questions. The COTA exam has 200 multiple choice questions. Yes but they take up your time limit. Can I make notes during the exam? How are OT/OTA examinations scored? Scores are reported on a scale ranging from 300 – 600 points. 450 is the minimum required score to pass the OTR & COTA exams. It is not required to pass each individual domain that is tested on, your score will be based on performance across the entire exam. For OTRs, this means you do not have to pass both the Multiple Choice and Clinical Simulation sections of the exam. How do I obtain my test score? The NBCOT scores exams twice monthly. Wait about 3 days after your exam and you will be able to check online to see if you passed or failed, as long as you took the exam at least 3 days before a score release date, just visit this webpage to check your score. 4-6 weeks after you test date you will be mailed an official score report. In order to have the score report sent to your state licensing board, you must fill out an Official Score Transfer Request during the application process or right after you take the test. Is there a list of books or study material used to create the exam? The NBCOT maintains a list of the top 10 textbooks used to create both the OTR and COTA exams. They create an in depth report every so often that lists the textbook names and how much of the exam was created from them as well as which parts of the exam were created from each book. You can find the most recent updated reports for both the OTR and COTA exam here. Which mnemonics or charts were most helpful when studying for the NBCOT exam? Charts and handouts on topics like Moro, STNR, ATNR, and Babinski were extremely helpful. Also, charts of common splints were extremely helpful. Try creating a page for each splint with an image and description of it that includes the splint name and use. Also make sure to review Ranchos, Glasgow, MMT, Brunnstrum, Coma Scale, and ROM norms/scales. Do you have any tips for the multiple choice questions? Practice your clinical reasoning skills. 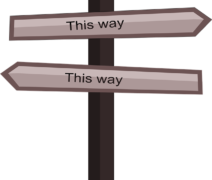 You need to be able to read a treatment scenario and choose the best option. Most of the time two of the multiple choice answers will clearly be wrong and you can immediately eliminate them. Then you are down to just two options. Is there a tutorial to show you how to take the exam? You can watch a tutorial before your exam time begins that will teach you how to proceed with the exam. Do you have any other advice at all that may be helpful to students preparing for the NBCOT exam? The best advice is to take practice exams repeatedly. Take one early just to gauge where you are. Then go back and repeatedly take practice tests focusing on the study areas that you get wrong. Also, don’t forget to go over the basics, they are important and should be embedded in your memory to help with the many types of questions you will see. Make sure you know your norms, scales, common splints, reflexes,as well as diagnoses contraindications. Study alone, but also participate in study groups. Quiz each other and discuss why the right answer is right. Congratulations, you just finished reading the ultimate 5,000+ word guide to OT Exam Prep! Now all you have to do is download our free study guide and start studying! So, now you can stop freaking out about the NBCOT exam searching for OT/OTA practice exams and questions online and you can spend your time more wisely. By studying! After you pass your NBCOT exam try our free OTA Salary comparison tool to help you to find the highest paying occupational therapy jobs. Drop a comment below if you know of any good OT Exam prep tips or resources that we left off our list. Wow, this is an amazing resource. Thank you very much! This is a really legit study guide, I’m surprised it is free. Aside from the practice questions, the calendar is really helpful too. But it would be nice if the questions were grouped by subject. I know they won’t be categorized on the test but for study purposes it would save me some time finding the questions I need to study. Just a minor suggestion, regardless thank you very much for this! So glad you’re using the study guide and finding it helpful! We will consider categorizing the study questions in our next update, that is a nice suggestion. Bookmarked. This is awesome. THANK YOU! My friend just took the NBCOT and so she got me interested in researching some study material. She sprung for the AOTA study course and said she thought it was worth it. I want to hear what students think about the TherapyEd course before I make a decision though. Can anyone share thoughts on comparing those two courses specifically? For now I’m stoked to get started with these free questions. However I agree with Willy, it would be helpful if the practice questions were categorized. Regardless, the PDF is awesome, thank you so much. Now I just need to stick to this study calendar! Wooo! Thank you! This was the push I needed to get started on prepping for the NBCOT. I shared this on Google+, but the PDF did not become available for download. The Google + share is working for us. Can you try it again now or try sharing on FB/TW?